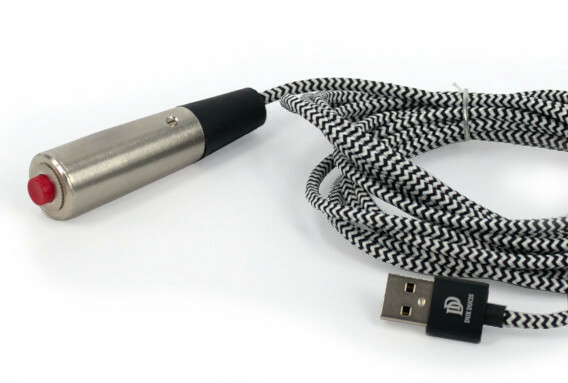 The “USB Pendant Button” is a hand-held switch on a USB cable. A press on the button sends a keystroke (or a mouse button click) to the workstation. You can configure which keystroke that is. You can use the USB Pendant Button to perform any command on the workstation: launch a presentation, start a show, pause or resume playback, or any other action. The button is available with a red and a black button cap. The USB Pendant Button is recognized by the PC as a “keyboard” —with only a single key. Microsoft Windows (and other operating systems) have intrinsic support for these devices. The USB Pendant Button runs out of the box, no driver is needed. 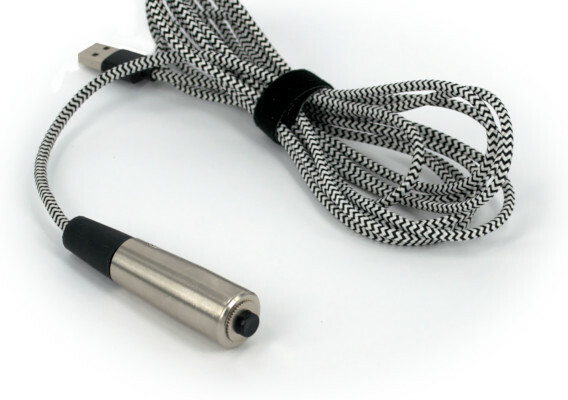 The USB Pendant Button is a robust hand-held switch on a 3 meter long cable. A “debounce” circuit avoids false triggering and an ESD protection filter on the USB input guarantees a reliable operation. As mentioned above, the PC or workstation recognizes the USB Pendant Button as a keyboard with one key. The key to transmit to the PC is configured via a free configuration utility, see the Downloads section. 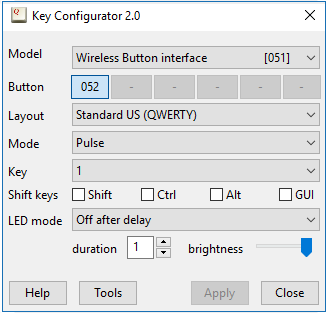 In addition to standard keys, that utility also allows you to configure a few extended functions, such as to function as a “play/pause” button on a remote control, or as a mouse button. By default, the USB Pendant Button transmits the keyboard key “1”. Multiple Pendant Buttons may be attached to a PC at the same time, with each Pendant Button (typically) configured to transmit a different key code. Dimensions Diameter: 19 mm, length: 77 mm. Weight 90 g (including cable). Colour Nickel-plated, button cap: red or black. Mechanical lifetime > 106 operations. Actuation force Approximately 5 N.
Cable Length: 3 m, braided nylon sleeve. USB connector Standard A connector.